I love this card! The color blocked Hello is perfect. I love that die!! How pretty! I love the graphic nature of your card and the colors in the sentiment! ohhh, so fun and colorful! love it! I love your card. Great idea to use that hello die. Very cool! Love the colors, and the blocking in the sentiment. Loving the color blocked word! Thanks for joining us at the CAS-ual Fridays Challenge! kari, this card is blowing me away. I LOVE this! I think color blocking with neon washi should be your new thing :) Thanks for joining us in the Play Date Cafe! This is a fantastic card! I LOVE your design, and the way you color blocked the washi! Thank you for playing along with The Play Date Cafe! 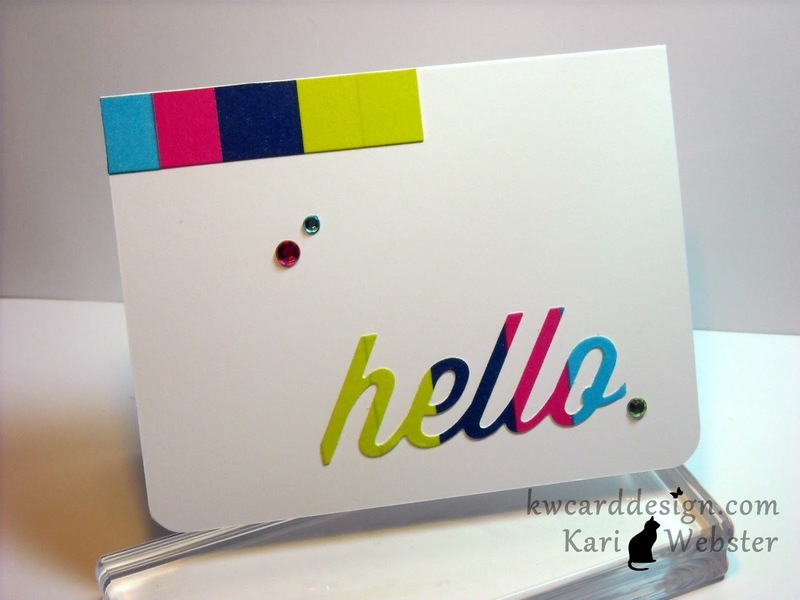 Love the vibrant colors - fabulous way to use washi! Kari what an amazing little card. Love it!